Conserve moisture and protect against weeds in planters and beds by spreading mulch around flowers and shrubs. Mow lawn to no-less-than 2″ in height, and never remove more than 1/3 of blades. Water all plants, shrubs, trees, and your lawn thoroughly, but infrequently. 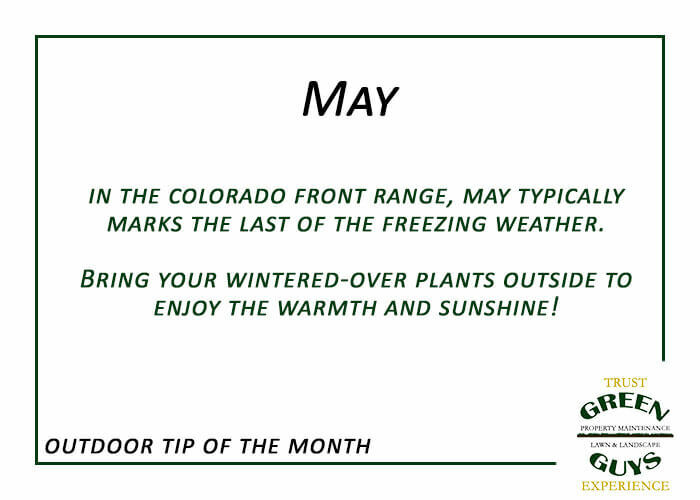 A week after the average frost in the Front Range (May 8th), move annuals and perennials that have been overwintered indoors outside.